Thanks to It's a Mad Mad World I already have my first read-a-thon for 2016 sorted! 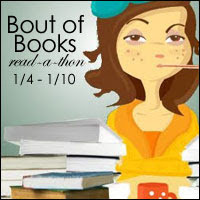 This will be my first year participating in the Bout of Books. Luckily not only do I have a lot of day time shifts, but I also have two days off in a row. So I'm looking forward to getting the year started right. It seems a pretty laid back read-a-thon with a few challenges set up each day that hopefully I can participate in, but I'll post the blurb below from the official Bout of Books blogs. There is a sign up portion if you want to official join in. I'll be doing both my Twitter account (@_sullybear_) and on the blog. As of right now I'm not real sure what I'll be reading that week. I have a vague notion of what the pile will look like, but I have a habit of deviating from TBR piles. So I might just wing it. Who knows, I have a lot of things I'm excited to read in those piles.